Sore muscles and bones will be soaked in a lovely bath tonight but there will be some great smiles with it. 10 women attended the Laser Coaching session today at French Bay Yacht Club. We had women from all over NZ and Auckland attending: Port Ohope, Worser Bay, Point Chevalier, Pupuke, Panmure and French Bay attending. A nice 15-25 knot breeze gave us some challenging conditions to apply our tips from our 2 fantastic coaches: Rachel Basevi and Jim Quinn, there were some acrobatic pirouettes around the reaching, windward, leeward course but eventually each laser was going faster. Everybody came back with some new knowledge that they will apply while racing at their respective Clubs. So a big thank you must go to Rachel and Jim for sharing their experience and giving us valuable personalised feedback to each of us, we really appreciated it. 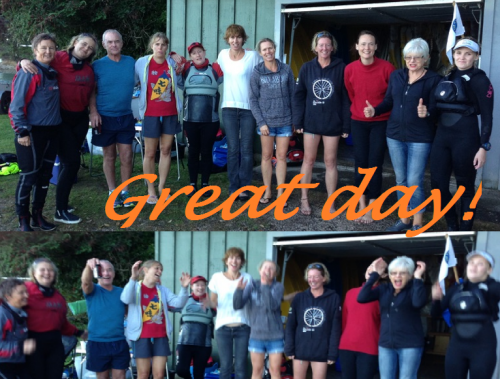 A special thanks needs to go to French Bay for hosting such a fantastic event, we all enjoyed the yummy baking after a hard day sailing. There is another great event next week for Women Laser Sailors, the Auckland Women Laser Championship at French Bay Yacht Club on 19th April. 8:00am registration, 9:00am briefing and 9:30am Start. Make sure you all attend! The Laser Champs were held as part of the Evans Bay Regatta. The 2015 Auckland Masters Championships, held at Tamaki on Saturday 21st March, attracted almost 40 entries with 25 Standards and a good group of Radials. 5 races were completed for both fleets in tricky E to NE breezes between about 5 and 12 knots. Seas were typically lumpy Tamaki sea breeze conditions with the heavy harbour traffic adding to the wind against an outgoing king tide for 4 of the 5 races. In the Radial there was a very tight contest with current World GM champion Mike Keeton eventually prevailing by one point with a 1,1,1,2,3 scoreline over Richard Blakey, who made the podium in Hyeres in the Masters division, with a 1,1,2,2,3 scoreline. Third was Whangarei visitor Roger Winton who managed to get between Mike and Richard a couple of times and was unlucky not to pull off a win in one race. Shaaron Mckee was the leading Women’s Masters Radial sailor. In the Standards reigning National Masters champion AM Kris Decke from Whangarei ended up winning convincingly with 4 bullets after starting slowly, having got caught on the wrong side of the beat in the first race. Second was expat Kiwi GM Gavin Dagley, now resident in Melbourne, who managed to show consistent form in all 5 races to convincingly win the GM division from third placed Nick Page (Pupuke), who was fortunate to be able to discard a meltdown in the 4th race. Leading Master was local Tamaki sailor Nick Brewer, back in the Laser after focussing on sailing the Mistral with his kids in recent times. Leading GGM was Bob Blakey, who showed he is still a force to be reckoned with a 2nd in one race in spite of turning 70 in the next few days. It was great to see 5 GGM’s in the Standard fleet, with Bob, Sandy Grigg, Jack Hansen, Dave Almond and Derek Bond all mixing it up during the day. 2015 is flying by! Another month of great training back in the NZ summer, and a couple of local events have now come and gone. Both Oceanbridge Sail Auckland, and the OKI 24 Hour race have been great tests for different reasons. Sail Auckland was a tightly contested battle, and the 24 Hour race was definitely a physical battle in some very testing conditions! Panmure Lagoon Sailing Club has had yet another successful Regatta that saw 39 Laser sailors & their steeds from all over the World – Canada, Austria, Switzerland–as well as the North Island, Taipa, Onerahi, Hamilton and Lake Ngaroto come & do battle on this challenging spot of water in Auckland. The winds defied all predictions coming in at 8 t0 11 knots from the South West giving our illustrious race officer Garth Briden something to work with. He managed to fire off 4 races even though those errant jockeys pushed their valiant steeds across the line three times in false starts. Garth got the measure of those miscreants by black flagging the starts which brought those fiery steeds back under control. The fleets were very tight with even the top end being continuously hounded by the hoards doggedly nibbling away at their heels. The day closed with a BBQ & lamb on the spit followed by Prize giving with Daniel Barry from Canada taking out the RSA trophy & some other great goodies, which included a top section, 2nd place went to Andrew Childs from Taipa with our own Paul Page taking out 3rd. The Radial fleet was taken out by Loïc Eisenring of PLSC with 2nd place going to Kailash Clearwater of Taipa & Kevin Welsh PLSC taking 3rd place. Jana Senn from Nautic Club Austria won the First Women trophy. This was followed by spot prizes. We have to thank to our invaluable army of helpers who kept the whole day running like clockwork and our Sponsors who donated an impressive list of prizes. So we thank our generous Regatta sponsors: RSA, Waipuna Hotel and Conference Centre, CRC, PredictWind, Auckland Seaplanes, the Water Shed, Survitec Group, Auckland Marine Centre, Red Carpet Tours, Boating NZ, Sugarcraft, Joy Adams Sails, Flyajet, Mortgage Express, YMCA and New Zealand Maritime Museum. It's been a while since my last update in September after the World Championships in Spain. A lot has happened between now and then. 2015 is now well underway and my first two events of the season have finished. The NZ Laser National Champs off Takapuna, and the ISAF Sailing World Cup in Miami. Click the link below to read a quick update on how everything has been tracking. Happy 2015, and thanks for the continued support!